On closer inspection, youcan already see four problems. 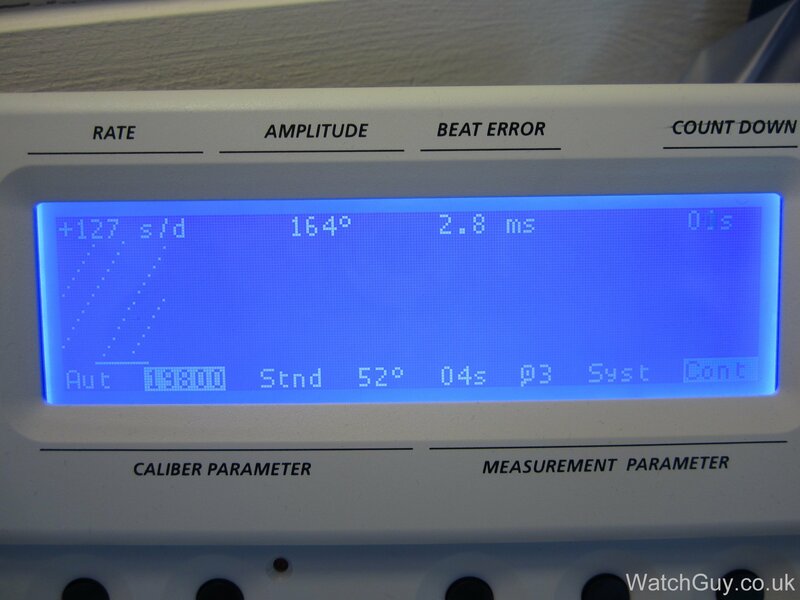 Firstly, the date window on the dial is wrong. 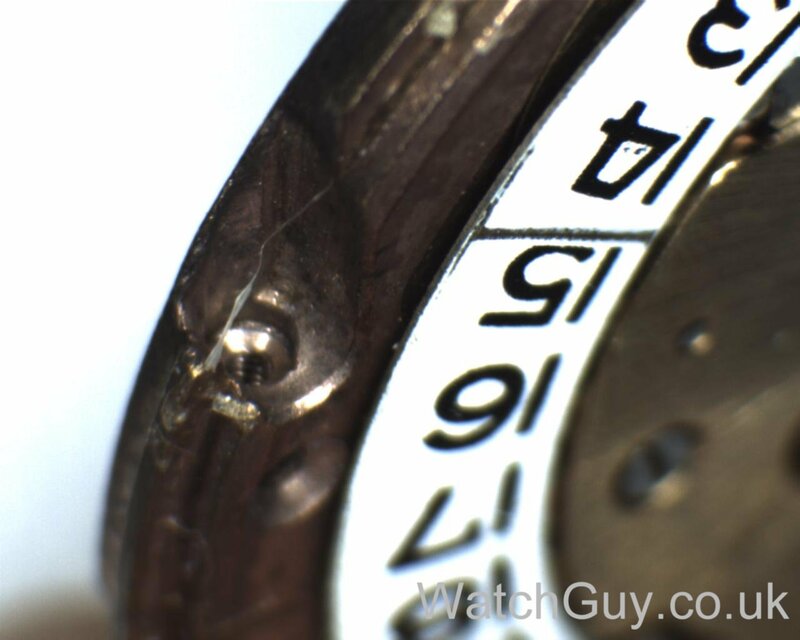 It’s not the right shape, and you can see the teeth of the date wheel on the left. Secondly, the second hand is red – that doesn’t look original to me. Thirdly, the batons on the markers are just painted on, instead of being little rubber inlays. 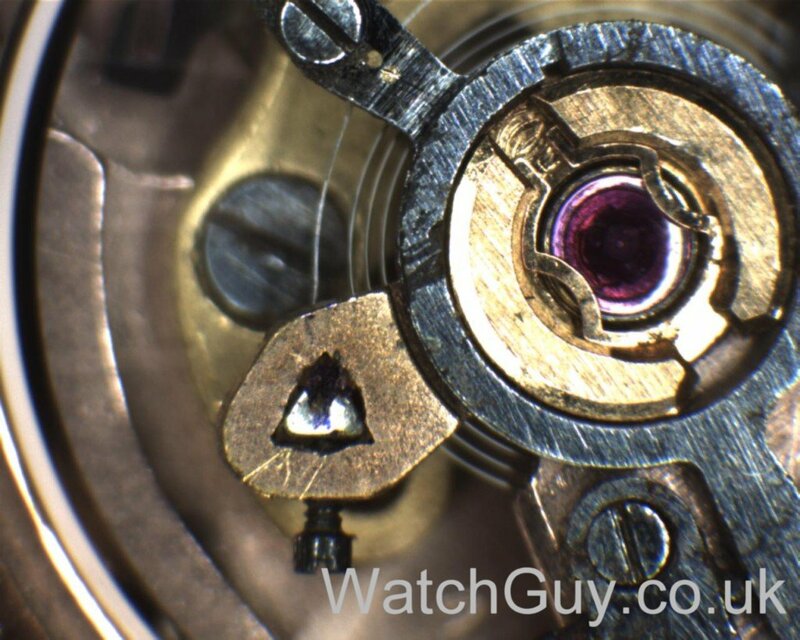 And, last but not least, somebody fitted a normal crystal instead of a tension ring crystal, so it will pop out easily. And I haven’t opened up the watch yet! This is terrible. 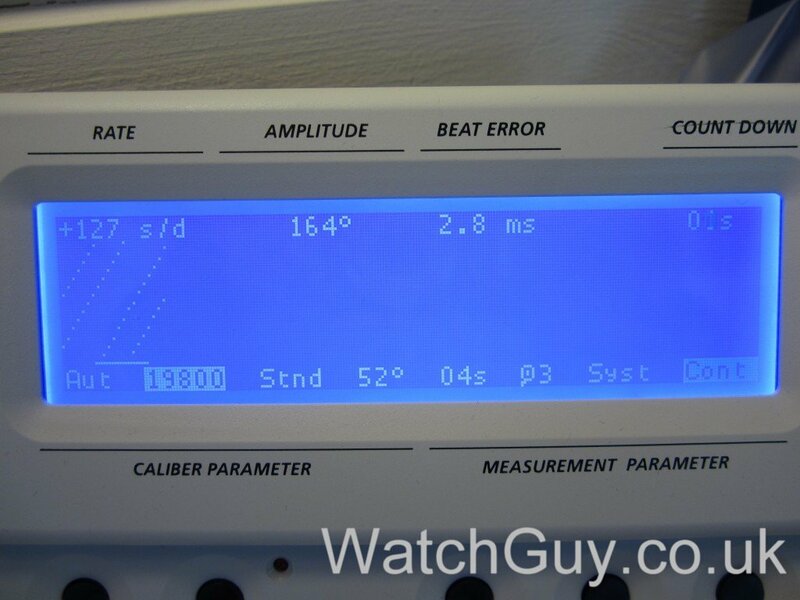 Very low amplitude, way too fast, and the beat error is a bit large. The movement definitely needs a service, if not more. 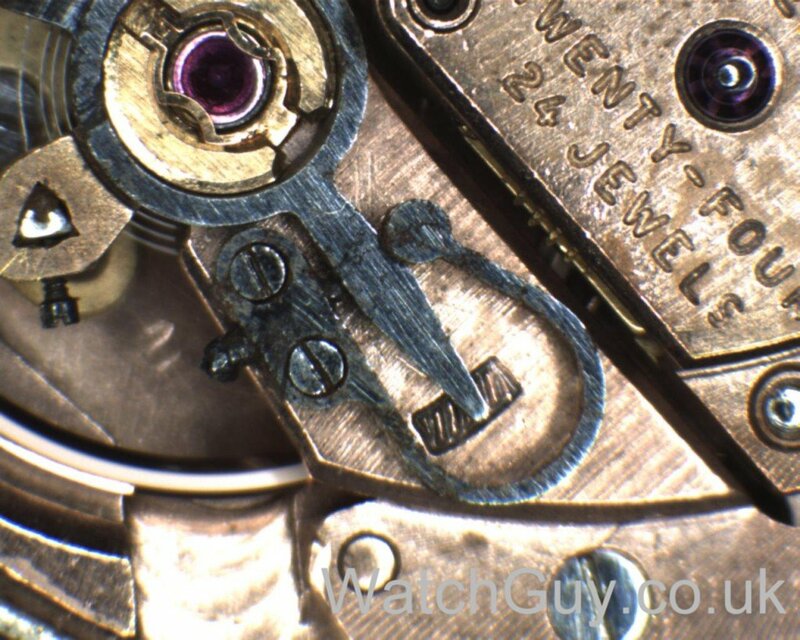 The dial back. At least a couple of restorations, and the last one with the wrong markers and the wrong date window. 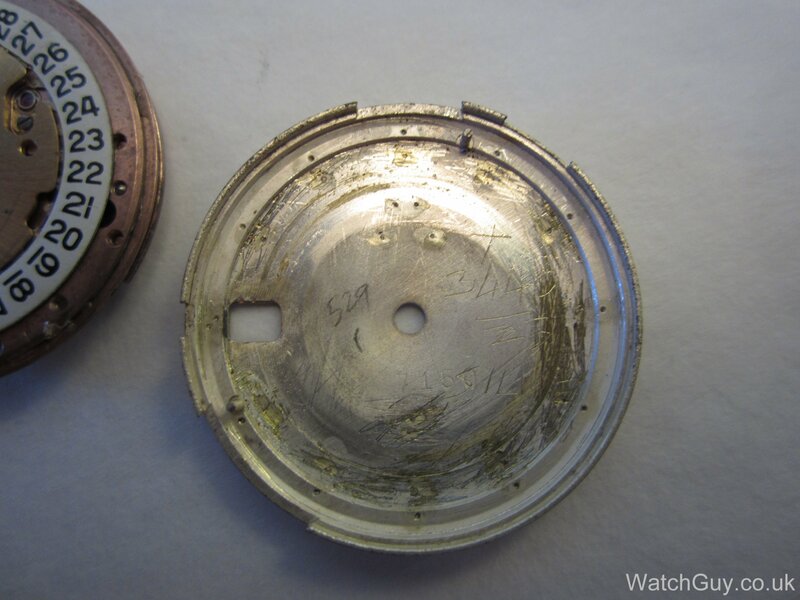 Even though the dial feet are still there, there are no dial screws, and the dial was glued on. The mind boggles. The screw for the swan neck regulator has been thoroughly mangled, probably by adjusting the screw with pliers instead of a screwdriver. The hairspring stud appears to be glued in as well, so the thread of the screw that normally holds the stud is probably damaged. Somebody hit the auto winder bridge with a punch or something similar, and quite hard by the way it looks. You have to move the gears a bit to let the bridge slide into position. Alternatively, use a hammer. The rotor bushing is completely worn, and the rotor hits the movement and the case when it turns. A bit of glue where the dial screw should be. This is my favourite bit. Looks like the pendant tube was missing, and, instead of buying one that fits, or modifying one, somebody hammered a pendant tube into the case. Now it fits. I’ve had enough, and I don’t want to take the movement apart, but I’m sure there would be more surprises if I did. This is one of the shoddiest watches off eBay I’ve seen, and I’ve seen quite a few. If tempus.fugit.2012 has any sort of conscience, he should fully refund and stop selling crap like this. This entry was posted in HowTo, Swiss, Wrist Watches by Christian. Bookmark the permalink. Oh, and by the way, if you paid via a Credit Card using Paypal and the item was misrepresented, you can also try contacting the credit card company to pursue a refund through them. 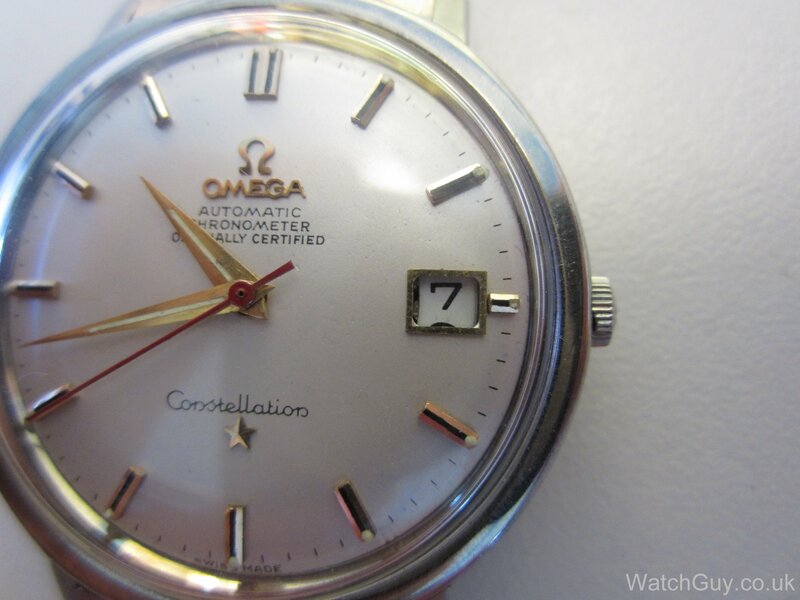 There are a lot of Constellation fakes, redials and frankenwatches about and if you’re not too clued-up it’s very easy to get burnt. 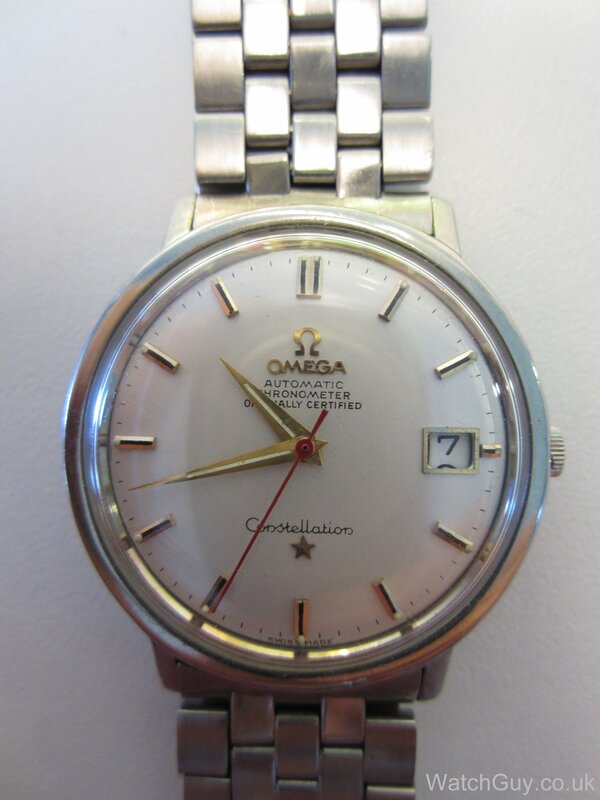 If you want one and you’re not sure what you’re looking at, I recommend you study Desmond Guilfoyle’s blog http://omega-constellation-collectors.blogspot.co.uk/ and ask him or post on Omega forums http://omegaforums.net/ for advice. 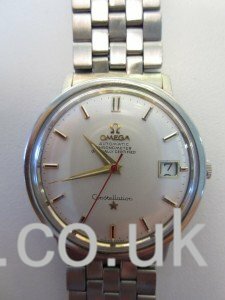 You will probably pay a little extra for a nice one or one that has been vetted by the Omega forums experts, but in the long run it will be worth it! Thanks for “warning” other Christian. Watches received today. I contacted the seller but Ebay was not interested as it was after the “X” days after they offer customer support on items. The seller was poor but I am sure he was pleased to rid himself of the watch. 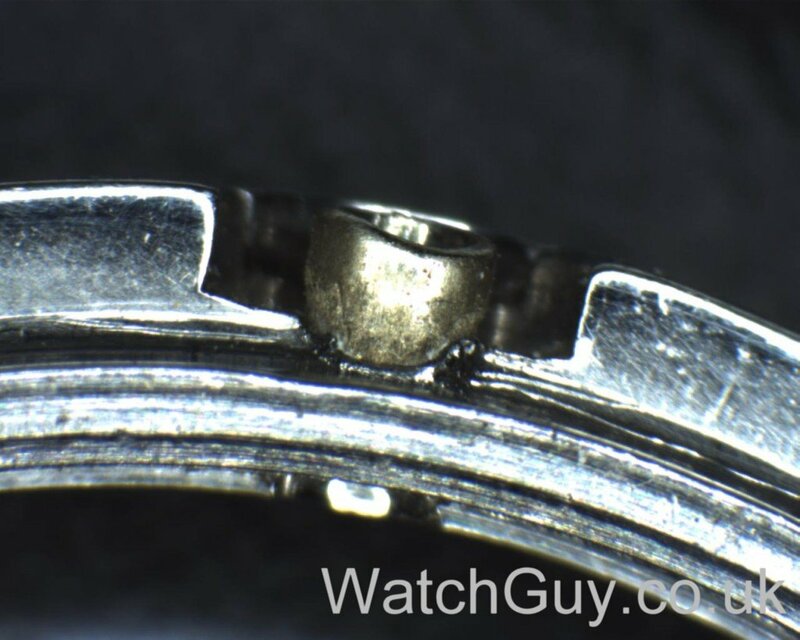 At least the watch is now usable as such so thank you for that. Remember to butcher the sellers feedback! It is a good gesture in order to warn of others! Buying off the bay is a risk but perhaps not a risky as you might think. If Stephen shows this page to eBay I would be amazed if they do not issue a refund! They may chase the seller first but even if he refuses to refund I think ebay themselves would issue the refund! The case looks nice enough at least… will the correct pendant tube fit after the incorrect one was forced in? 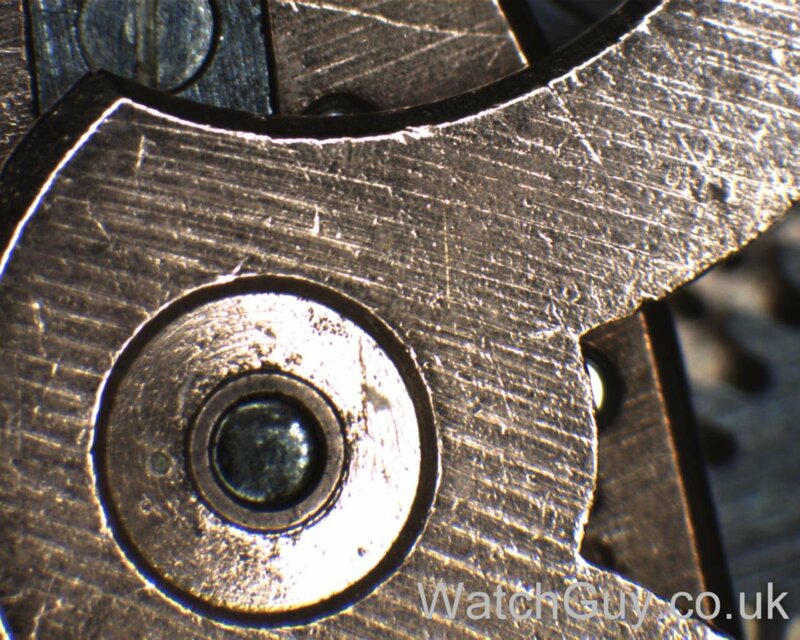 It’s a 561, and, without the right dial, it’s not worth doing anything to the watch. I fitted two dial screws and sent it back to Stephen. 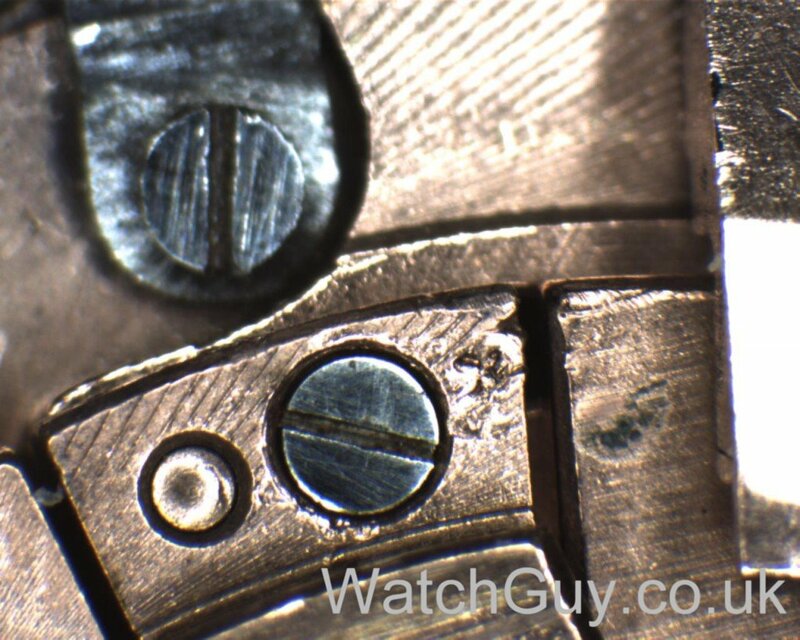 Ofrei have a selection of Constellation dials for that movement – none hugely expensive – if that is the main issue?